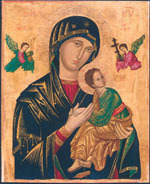 The Redemptorists » Our Mother of Perpetual Help, pray for us! Four Redemptorists are participating in a special three-day celebration in honor of Our Mother of Perpetual Help at St. Patrick’s Cathedral in New York City. We will share the homilies from each day’s Mass on redemptorists.net. Who was she to be pregnant with God’s love for the world? Who was she that she too became the first tabernacle? Mary was probably of little account in the world’s accounting. She was poor. She was unexpectedly expecting, and possibly ashamed of her unmarried status. Now I’m saying all of that because we, too, are pregnant with God’s love for the world. We, too, bear Christ to the world. As God’s people in Christ, we are very much like Mary. And we may wonder, who are we to be this? We may feel inadequate to be God’s bearers of love. We may feel unqualified to bring God’s mercy into the world. We may think we are unprepared to do the things of God. We may sense we are unworthy of such a high calling. But as pregnant as Mary was with Jesus, so is the pregnancy pregnant with the power to create more love than hatred, more light than darkness; more hope than sadness. It’s a big claim, not an easy one to make or accept, but without it, God’s mercy is meaningless. Mary gets it, and she sings her song. Mary sees and accepts that in her lowliness, in her smallness, in her poverty, in her unimportance, God was doing what God always does. God works his ways through people such as Mary. God needs and uses people who are truly humble, genuinely in need, truly able to trust God above all things, and so let themselves be small within the realm of God’s greatness. Who was Mary that she should be pregnant with God’s love for the world? Who was Mary that she should bear Christ to the world? She was no one, and she knew it, and she embraced it, and she magnified God for it. Who are we that we should be pregnant with God’s love in our lives? Who are we that God should use us to bear Christ to the world? Whether we know it or embrace it, when we use it we magnify God. It’s tough here in the city to do this, what with all the lights, but if you ever, on a clear night, look at the stars, it can leave you with a sense of wonder and astonishment. I am so small. This world is so vastly bigger than I am. What place do I possibly have in it? But Mary’s song should put an end to that question. Mary’s song is radical and astounding and full of promise. Mary’s song says that God lifts up the lowly and needs them for God’s purposes, and God will help the proud and powerful understand this by bringing them down to their true humanity, their lowly status, their true need before God. Who are we that we should be pregnant with God’s love and bear Christ to the world? Absolutely nothing and nobody. And that is exactly as it must be. And then there’s this reality to accept: Being pregnant is never an end in itself. In this final line of the Magnificat, we are listening to Mary ponder her own astonishment at being so small and yet bearing something so great in her. But we know the goal for this is to get to the birth. If we as God’s people in Christ are pregnant with God’s love for the world and bear Christ to the world, then the only purpose this serves is to actually give birth to it. For our lives of faith, getting beyond merely being pregnant with God’s love for the world means actually living it out here and today. Who needs lifting up? Who is lowly among us that God is seeking to honor? Who is poor and hungry and in need of mercy and compassionate food? This is how we bear Christ to the world, this is how we give birth to God’s love for the world: We live out Mary’s song. We become lowly ourselves by serving and giving and loving. We become powerfully pregnant with Christ as the church. But we don’t stay pregnant for long. There is life to give. There is love to share. There is mercy to grant. There is a song of praise to sing, magnifying God for all these good things God does, even including the likes of us in God’s purposes. Mary, to be sure, was the first bearer of Christ but she was not the last.